I heard about this product recently and when I stumbled across it in a shop in Central London, I thought I'd get some to review for Tale of Painters. Vallejo Surface Primer is an undercoat paint. The one I'm reviewing is in a 200ml bottle and is formulated to go through an Airbrush or be hand painted on. You can get it in 17ml or 60ml and is also available in grey and white. Games Workshop Citadel Colour Undercoat sprays come in 400ml cans. It costs between £9.89 to £10.99 depending where you buy it from. It's Acrylic-Polyurethane so it's hard wearing strong coat of paint that is self levelling. It's airbrush ready straight out of the pot so it' doesn't require thinning. 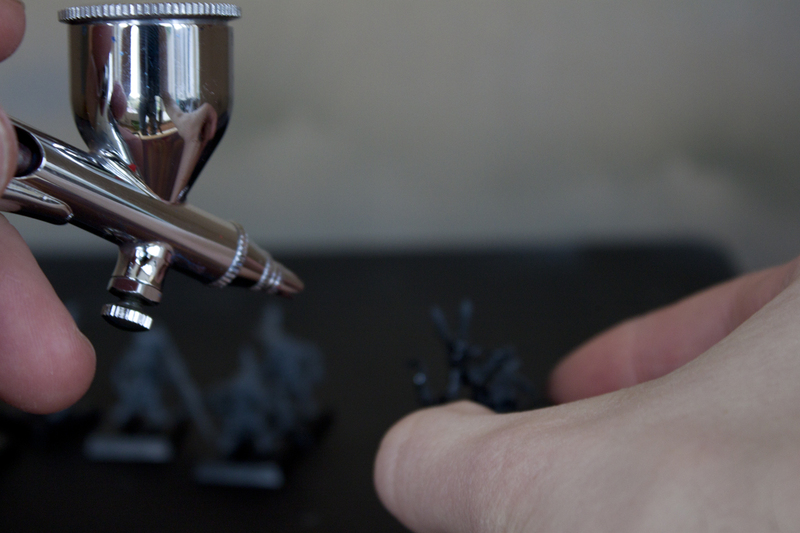 I used a 0.2ml nozzle on my airbrush and it worked beautifully and didn't clog once. 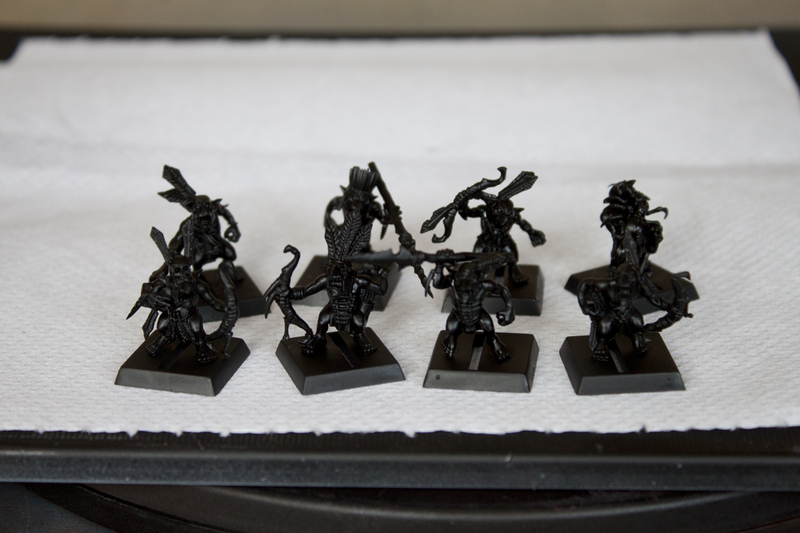 The airbrush can be set up to spray small and fine so I was finding that I was getting hardly any waste or overspray when spraying my Forest Goblins. Because the Primer hadn't been thinned, I could just tip it back into the bottle when I was done. 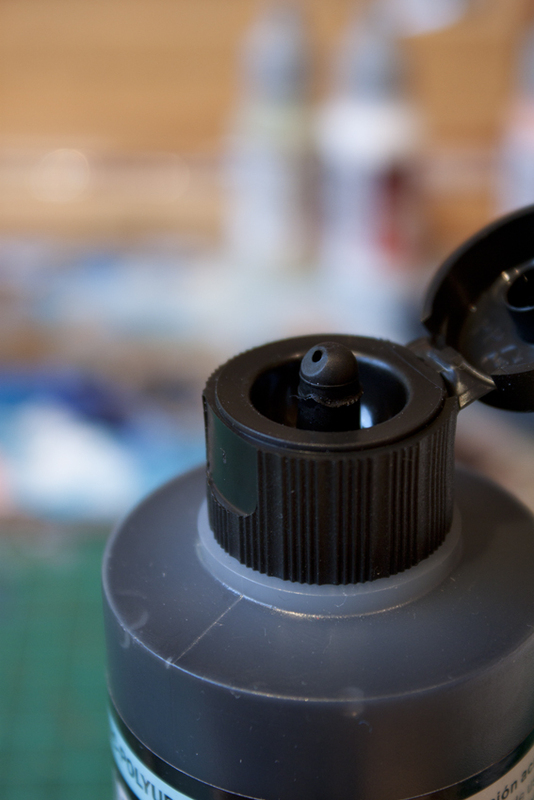 Hardly any paint was wasted, unlike aerosol primers whose spray is wide and there is always lots of overspray. Clicking the above pictures will show you how smooth the coverage is. It's amazing. Another benefit is this stuff isn't effected by temperature like aerosol primers. So you can spray in the winter time. There is an odour but it doesn't smell as strong as aerosol primers, so I felt comfortable spraying indoors. 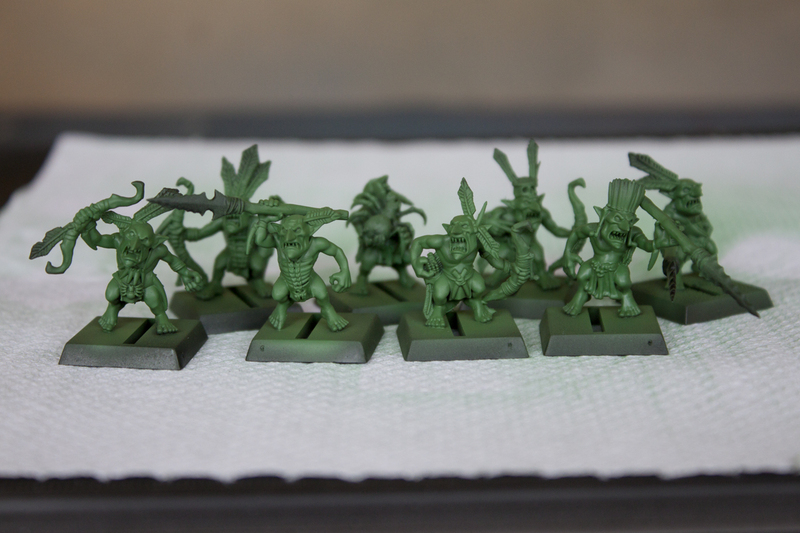 I sprayed some green over the goblins to see how over paints sit on top of the primer and the results are perfect. I actually think the models show more detail and have less clogging or furring that an aerosol produces. The green coat seems to adhere to the primer perfectly. 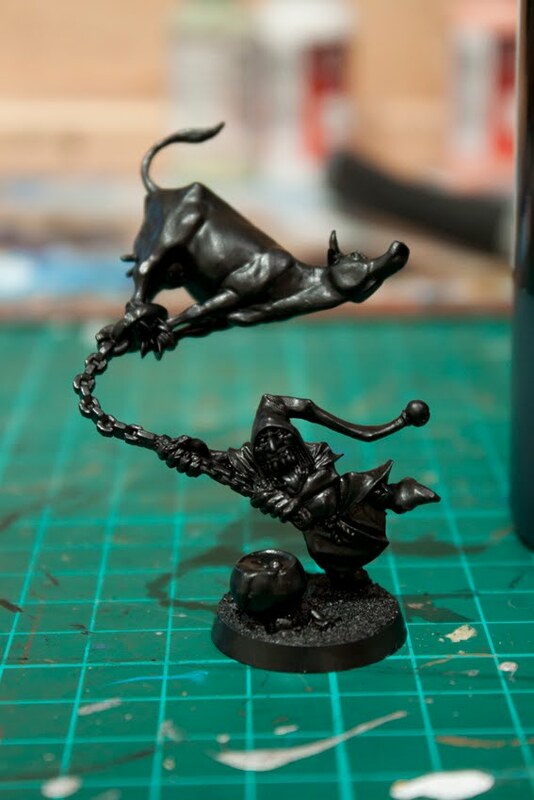 The primer doesn't appear to chip easily like it would if you just painted chaos black straight onto bare plastic. The other great thing about this primer is you can apply it by brush. It still self levels and leaves no brush marks for a smooth coat. I picked up an old conversion that has been in my bits box for years because I wanted to see the results on metal as well. The flip top lid of the bottle is really cool it has a tiny hole that is at a 45º angle to help with pouring the product. It's a neat touch. The first coat I did, covered ok but looked a bit thin, a second coat sorted it right out and produced the above result. I had a go at rubbing my finger over the edges once it had dried and it didn't chip or rub off. I would have to go at it harder with an abrasive to remove it. Both the airbrush and hand painted results showed an even black colour, unlike some aerosol primers which can go grey or chalky and both came out smooth and matt. Conclusion. This stuff is great. I'm a complete convert. I won't be buying GW spray primers anymore. This stuff will last longer despite being half the size because there is minimal waste which means it will be cheaper in the long run. 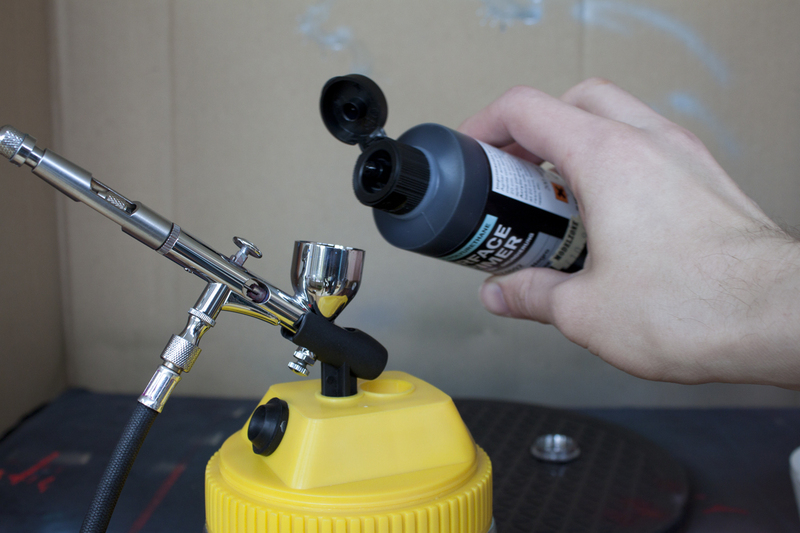 It's more accurate to use an airbrush or hand paint compared to a spray can and gives thinner results which look like they show more detail without sacrificing strength or durability. The only downside I can think of is if you're spraying a single model occasionally it might become a pain just to spray a single mini with the airbrush for a couple of minutes and then spend 15 to 20 minutes cleaning the airbrush afterwards. Do you like our tutorials and reviews? 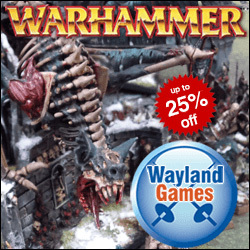 Here is what you can do to support us: Disable your Ad Blocker or place your next Wayland Games order by clicking here or on the banner on the right. Thank you very much, we appreciate any help to keep us going! thx for the great tutorial! I have to agree with you on how good this product is. My only objection is that it smells, and pretty strongly too! Plus setting up my airbrush and then cleaning it after use makes the whole undercoating business take much longer. So I guess if I want to save time I will stick with aerosol sprays (especially GW). Still, a great tutorial and a great product! My sense of smell is terrible. Virtually non-existent. Just asked my wife to smell it and she confirms it does have an odour. Thanks for pointing it out Achilles. I'll amend the review. 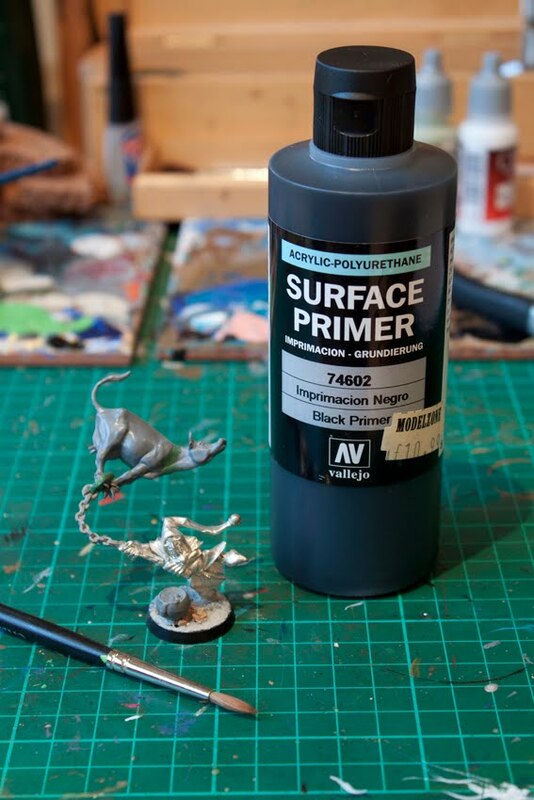 Just recently picked up the grey primer from Vallejo, and have to agree on all the points above. Used it to prime up some Gamezone metal Harpies, and it seems that the primer was better than the regular aerosol can primer. Better yet, was able to do it indoors since it was not the best weather outside. Great stuff, and a convert myself, regardless of cleaning time for the airbrush. Funnily enough I was just considering some of this stuff - was looking for a review and got one from one of my colleagues - great minds think alike. Cheers. rev. I picked up both grey and black a couple of weeks ago. Haven't gotten a chance to use them yet, but am really looking forward to it now that I've read this review. Thanks, Garfy. 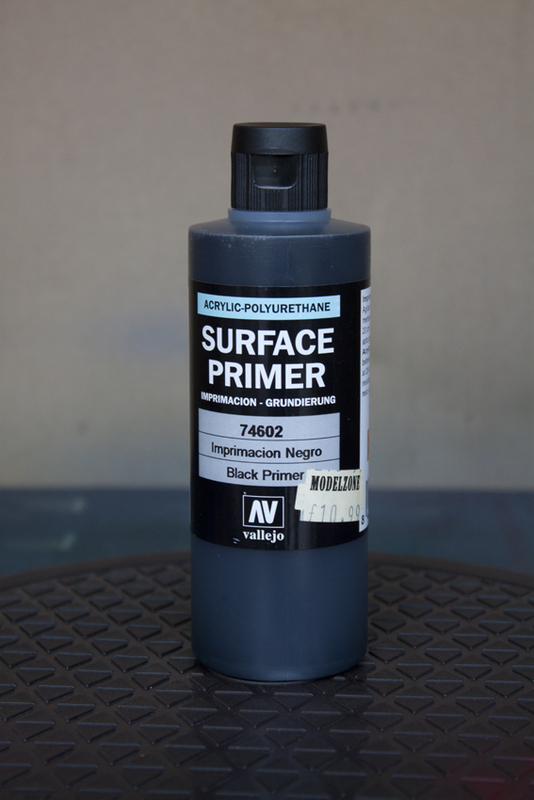 I also use those the grey and white primers from Vallejo. Very pleased on the results, though as mentioned you spend more time cleaning the airbrush than actually applying the coat. I've been using them lately in the past few months, and yes, they're definitely awesome. The great thing about these surface primers was that I can finally do my priming indoors using the airbrush, without the aerosol smell (doesn't mean it's odourless) or having to wait for the perfect weather. Good product review! I shall have to look into buying some of this. I've recently been liking white gesso to undercoat, but if I have to do a few models at a time, it can get time consuming painting it on by hand, and due to it drying so fast, I wouldn't recommend trying that through an airbrush lol. Does this stuff come in white or light grey? Fantastic. I'll have to pick some of this stuff up. I'm curious how handy it will be on larger items like tanks? Perhaps the GW spray is still better suited for such things? @oni - This stuff is self levelling, it doesn't drip or streak. It'll be really good on large flat things. I have Grey Knight StormRaven in the pipeline. I'll try it on that and let you know if it doesn't work. 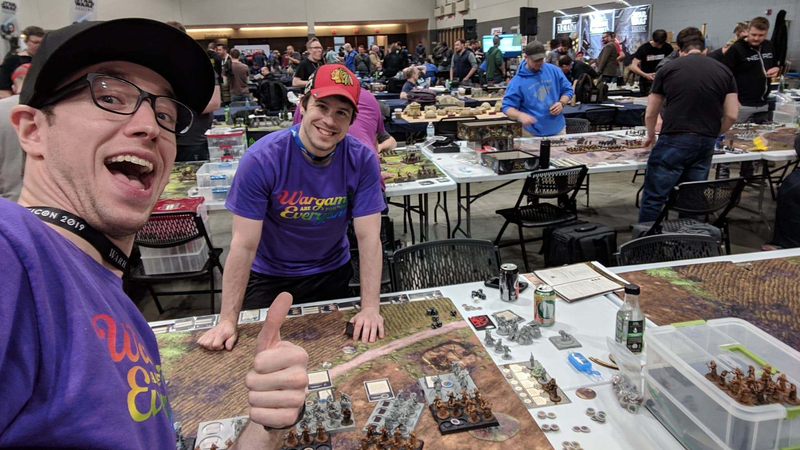 Nice review was looking at getting some. However on a slightly unrelated note, what Goblin miniatures are those. 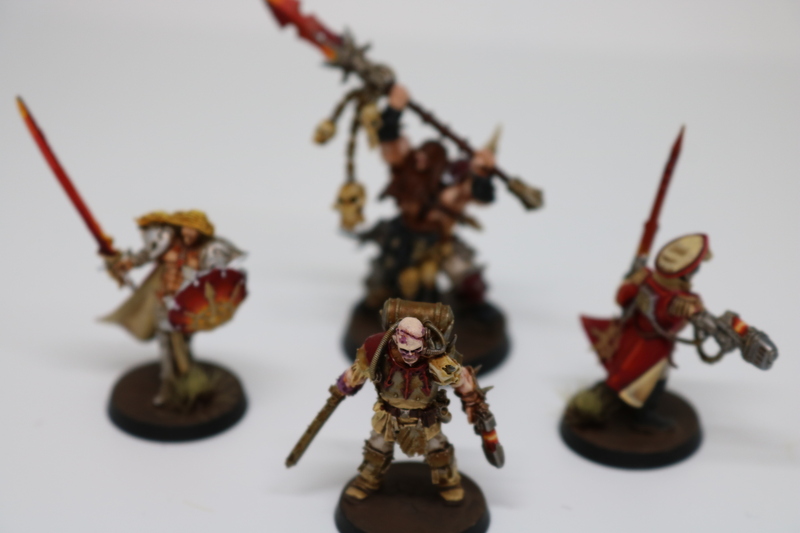 I thought they were some kind of GW Forest Goblin, but I can't find them on the GW website if they are. They are GW Plastic Forest Goblins, but they come with the Arachnarok spider. They ride on it's back in a howdah. 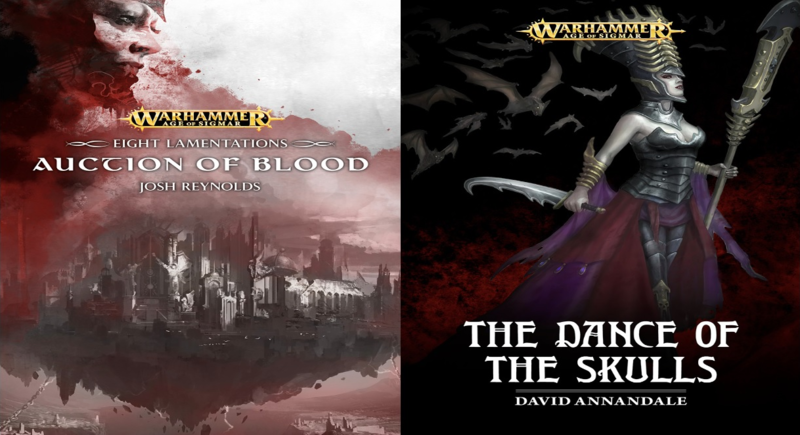 GW really should release them as a separate box set. I think they'd prove popular. Just read most of you post about airbrushing & all thing's related, it been a real help as im just getting a set up my self. Just wondering what psi your shooting this at with a 2mm needle? It operates at around 25psi. 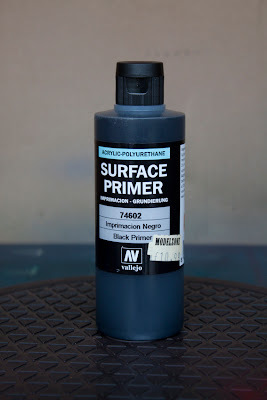 Has anyone tried these primers in White (painted with a brush)? 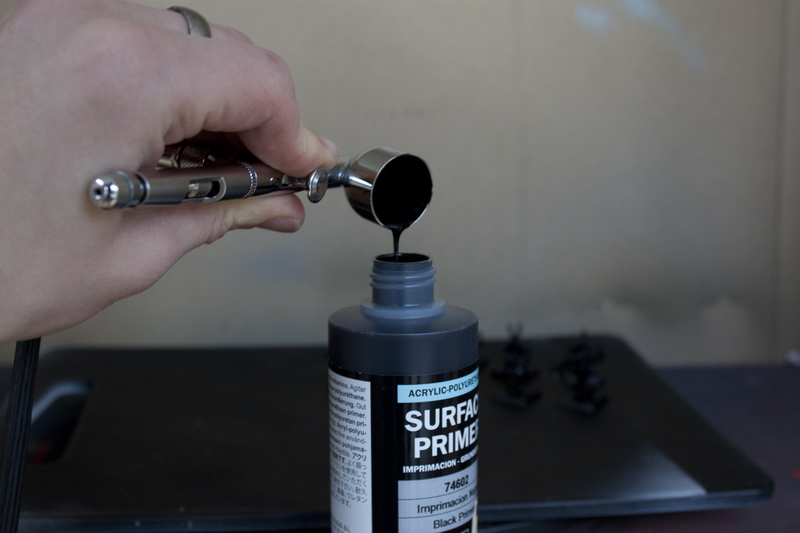 I don't have an airbrush or space to spray, so I'm looking for the best white and black brush on primers. Love the articles and would appreciate any advice! I have just picked this primer up Anonymous. Priming with it atm using a brush. Will get back to you. This looks great; I live in a humid area (southern United States, Florida to be exact) so spray primers tend to always end up fuzzing on me. This looks like just the thing for me since I can brush it on figures and get a solid undercoat. You really don't want to use this indoors without an extractor fan or a respirator at the very least. Poly paints are very nasty if you inhale any fine particles.